اسدی, سعید. (1396). شبیه سازی برخورد نانو قطره به سطح مورب در فرآیند ایجاد پوشش های نانویی توسط دینامیک مولکولی. نشریه علوم و مهندسی سطح, 13(32), 41-50. سعید اسدی. "شبیه سازی برخورد نانو قطره به سطح مورب در فرآیند ایجاد پوشش های نانویی توسط دینامیک مولکولی". نشریه علوم و مهندسی سطح, 13, 32, 1396, 41-50. اسدی, سعید. (1396). 'شبیه سازی برخورد نانو قطره به سطح مورب در فرآیند ایجاد پوشش های نانویی توسط دینامیک مولکولی', نشریه علوم و مهندسی سطح, 13(32), pp. 41-50. اسدی, سعید. شبیه سازی برخورد نانو قطره به سطح مورب در فرآیند ایجاد پوشش های نانویی توسط دینامیک مولکولی. 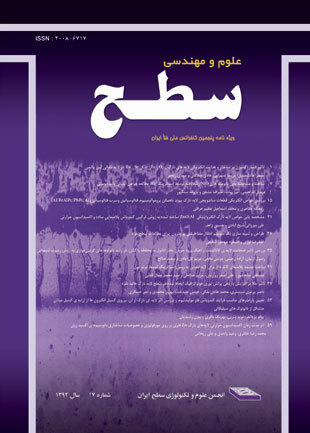 نشریه علوم و مهندسی سطح, 1396; 13(32): 41-50. پوشش دادن سطوح توسط نانوذرات، کاربردهای وسیعی در صنعت دارد. بسیاری از سطوح بصورت مورب در مقابل نازل پاشش قرار می­گیرند که باعث برخورد مایل نانو قطره با سطح می­شود. در این مطالعه، توسط شبیه­سازی دینامیک مولکولی، برخورد نانو قطره با یک سطح مورب بررسی شده و میزان پخش قطره روی سطح مورب و در زوایا و سرعت­های برخورد متفاوت، مورد تجزیه و تحلیل قرار گرفته است. نتایج نشان می­دهد که نسبت پخش شدن نانو قطره برروی سطح، با افزایش زاویه برخورد، اندکی زیاد شده ولی با افزایش سرعت برخورد، بشدت افزایش پیدا می­کند. نتایج نشان می­دهد که تاثیر پارامترهای موثر در پاشش­های حرارتی، مانند سرعت و زاویه برخورد در پاشش پلاسمایی، که در ابعاد میکرو صورت می­گیرند، برای پاشش‌های نانویی قابل تعمیم نیست. از مدلسازی در ابعاد نانو می­توان برای پیش­بینی چگونگی پوشش­های نانویی استفاده نمود و همچنین از آن برای کاهش هزینه‌های آزمایشگاهی و یا بررسی فرآیندهای پوشش سطوح در این ابعاد استفاده کرد. 1. X. Li, Y. Chen, S. Mo, L. Jia, X. Shao, Effect of surface modification on the stability and thermal conductivity of water-based SiO 2-coated graphene nanofluid, Thermochim. Acta, 595 (2014) 6-10. 2. W. Yu, D. France, S. Choi, J. Routbort, Review and assessment of nanofluid technology for transportation and other applications, Argonne National Laboratory (ANL), 2007. 3. J.C. Thies, E. Currie, G.J. Meijers, K. Gan, Method of preparing nano-structured surface coatings and coated articles, Google Patents, 2011. 4. P. Fauchais, A. Vardelle, Innovative and emerging processes in plasma spraying: from micro-to nano-structured coatings, J. Phys. D: Appl. Phys., 44 (2011) 194011. 5. M.E. Tuckerman, G.J. Martyna, Understanding modern molecular dynamics: techniques and applications, The Journal of Physical Chemistry B, 104 (2000)159-178. 6. X. Nie, S. Chen, M. Robbins, A continuum and molecular dynamics hybrid method for micro-and nano-fluid flow, J. Fluid Mech., 500(2004)55-64. 7. S. Asadi, M. Passandideh-Fard, M. Moghiman, Numerical and analytical model of the inclined impact of a droplet on a solid surface in a thermal spray coating process, Iran. J. Surf. Eng., (2011). 8. S. Asadi, M. Passandideh-Fard, M. Moghiman, The effect of contact angle on droplet impact onto a solid surface, Iran. J. Surf. Eng., (2011). 9. S. Asadi, Simulation of nanodroplet impact on a solid surface, Inter. J. Nano Dim., 3(2012)19-26. 10. N. Sedighi, S. Murad, S.K. Aggarwal, Molecular dynamics simulations of spontaneous spreading of a nanodroplet on solid surfaces, Fluid Dynamics Research, 43(2011). 11. N. Sedighi, S. Murad, S. Aggarwal, K,, Molecular dynamics simulations of spontaneous spreading of a nanodroplet on solid surfaces, fluid dynamics research, 43 (2011)1-23. 12. A. Satoh, Introduction to practice of molecular simulation : molecular dynamics, Monte Carlo, Brownian dynamics, Lattice Boltzmann, dissipative particle dynamics, Elsevier, Amsterdam ; Boston, )2011(. 13. H. Fukumura, Molecular nano dynamics, Wiley-VCH, Weinham, )2009(. 14. M. Griebel, S. Knapek, G.W. Zumbusch, Numerical simulation in molecular dynamics: numerics, algorithms, parallelization, applications, Springer, Berlin, )2007(. 15. H. Yu, Molecular dynamics simulations of wear processes, Arizona State University, )2003). 16. D.C. Rapaport, The art of molecular dynamics simulation, 2nd ed., Cambridge University Press, Cambridge, UK ; New York, NY, (2004). 17. G. He, N. Hadjiconstantinou, A molecular view of Tanner's law: molecular dynamics simulations of droplet spreading, J. Fluid Mech., 497 (2003) 123-132. 18. G. He, M.O. Robbins, Simulations of the static friction due to adsorbed molecules, Physical Review B, 64 (2001) 035413.